Of what importance is the system type to the installation? Nowadays, technical installations in all industries are characterized by ever-increasing complexity and automation. From highly developed production lines to robot technology, the amount of equipment that requires a reliable power supply to function smoothly is steadily growing. Therefore, the foundations for reliability and availability of an installation are already laid by selecting the right power supply system. Along with personnel and fire protection, fail safety is the key factor when choosing an appropriate power supply. During the planning phase of an installation, three system types are available: the TN system, the TT system and the IT system. What is an IT system? In TN systems, the star point of the supplying transformers is connected to ground through a low impedance and the exposed conductive parts of the electrical installation are connected to the protective ground (PE) of the system. 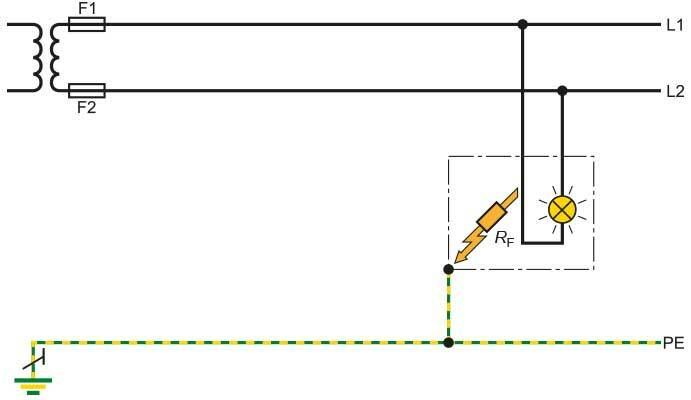 In TT systems, the star point is also connected to ground through a low impedance but the exposed conductive parts of the electrical installation are grounded independently from the system grounding. In IT systems, however, all active parts are isolated from ground or connected to ground through a high impedance. The high impedance can be applied for metrological reasons, provided that electrical safety is not jeopardized. The grounding of the exposed conductive parts of the electrical installation is carried out either individually or collectively. What is the key feature of an ungrounded system? As input to ungrounded IT systems, either a transformer or an independent power source, such as a battery or a generator are used. Since no active conductor is connected to ground with a low resistance, no high fault current flows in the event of a short circuit to exposed conductive part or a ground fault. The result is a low fault current the size of which depends on the insulation resistances and the capacitance of the conductors and system components to ground. As required by the standards, a ground-fault monitoring device is mandatory in a floating system. For example: If a person touches a live conductive enclosure in an intact ungrounded AC 230 V system with sufficiently small system leakage capacitances, he/she will suffer an electric shock. Under these conditions, only a small current that is not perceptible will flow through the person. The touch voltage is primarily determined by the voltage drop of the fault current via the protective ground conductor connected to the enclosure. Since the fault current (determined by the insulation resistance and the system leakage capacitance) is usually very small and the resistance of the protective ground conductor is also very small, no high touch voltages occur. 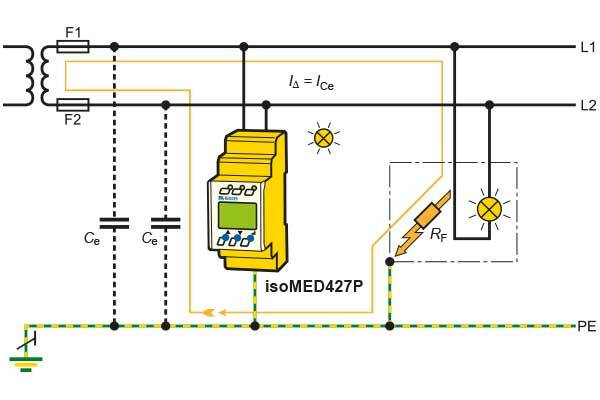 In contrast, a solidly grounded system is based on the idea that, in the event of a fault, a sufficiently large fault current is generated, which leads to a fast disconnection of the power supply. In the event of an indirect contact, this means that if a live conductive enclosure is touched, a high fault current will flow immediately through the person due to the low-resistance connection to the power source. Protective devices, such as fuses and circuit breakers, are mandatory in order protect the person by shutting down the installation before the person suffers permanent harm. In a solidly grounded system we assume that the fault occurs but take the necessary steps to avoid further damage. In an ungrounded system, a first fault does not interrupt the system power supply and therefore increases the availability of the system. What advantages does the ungrounded system have? In the event of a ground fault, the exact location of the fault can be determined while the installation is running. In the event of a first ground fault the installation may continue to be operated without any problems. Due to the low fault currents there is no risk of suffering an electric shock. Periodic tests do not require a shutdown anymore, GFCI test and RISO measurements are no longer necessary. The mandatory continuous ground-fault monitoring reduces the risk of fire and may lead to lower insurance premiums. Why has the floating system been rarely used until now? To date, the ungrounded system is mainly used in safety-critical applications, such as intensive care units or railway signalling technology, where a failure of the power supply would have disastrous consequences. Outside these special areas, this system type is not very common in practice, even though the floating system offers numerous advantages not only in terms of safety but also availability. Installing an ungrounded system is indeed more expensive than a TN or a TT system but the additional non-cash benefits, such as preventive maintenance and reduced test efforts, cancel out the additional costs within a short period of time. By using ground-fault location systems (IFLS), faults can also be quickly located in IT systems. By means of some technical measures that do not require any extra expenditure, standard components can also be used. Where are the limits of an ungrounded system? Each system type has its strengths and weaknesses, and selecting the best variant should depend on the application. In many practical cases, a combination of the three system types has proven to be the most optimum solution. The IT system has the best overall characteristics but it is only suitable for systems up to a certain size and complexity.